Latex relieves pressure points that can cause unnecessary tossing and turning. Latex is naturally resistant to dust mites, mold, fungus, and mildew. Latex "breathes" which helps in reducing body moisture. 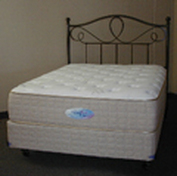 Latex provides a longer comfort life, a more durable, longer lasting mattress.